The pink hydrangeas at the bottom of this picture were blue when I bought them and have flowered blue for the last three years – a great combination with the orange lilies. I shall have to give them some strong medicine before next year. 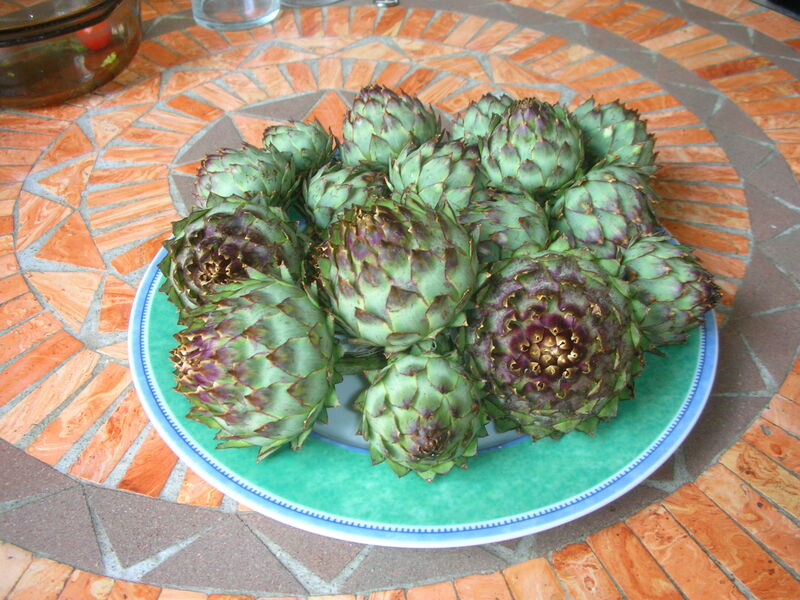 Rather pleased with the artichoke harvest. I know they are very small, but I am hoping to cook them and eat the hearts. I cropped the first runner beans yesterday and we are eating french beans too. This entry was posted in Gardens and tagged globe artichokes, Hydrangeas by hilarycustancegreen. Bookmark the permalink. Cooking artichokes! Now there is an art form. By the time my daughters were four and five I realised that it is not so much the artichokes as the Hollandaise that matters. An elaborate way to get veg into a child, but great fun.